Sushi rolls as we know them in the West. This type of rolled sushi, wrapped in nori seaweed, is called makizushi (which literally means ‘sushi roll’). In my experience however, this is not the most common kind of sushi in Japan. When you go to a sushi restaurant, you will mostly eat nigirizushi (meaning ‘hand pressed sushi’). Nigirizushi is a rectangular piece of rice with a large sliver of raw fish or seafood on top. Delicious nigirizushi. When you eat this kind of sushi in Japan, it is not unusual for the piece of fish to be twice the size of the piece of rice. Yummy! 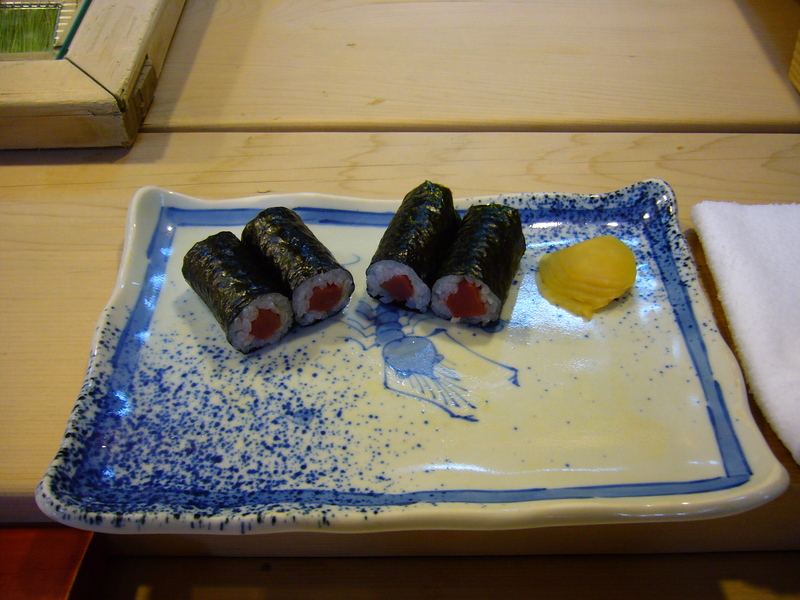 There is also a particular kind of nigirizushi that is quite common in sushi restaurants, called gunkanmaki. Gunkanmaki means ‘warship roll’. 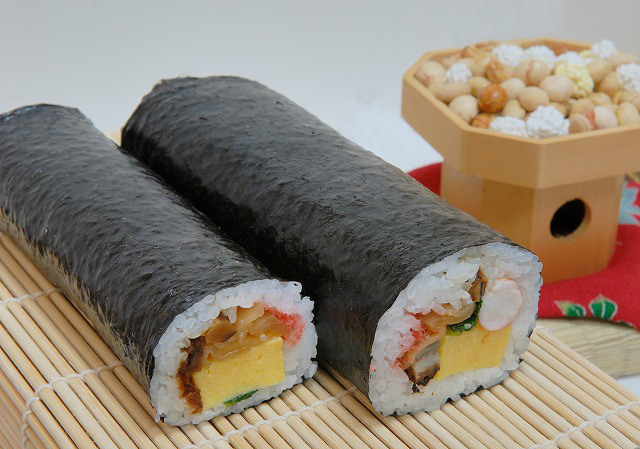 It is the same oblong base of rice as nigirizushi, with a fish or shellfish topping, but wrapped in a piece of nori. The nori serves to keep the topping of the gunkanmaki in place. It is usually prepared with softer toppings or some kind of fish eggs, which benefit from the structural support of the nori. In the picture below you see a gunkanmaki with sea urchin roe, but the most common kind is with salmon roe. A snapshot of one of our sushi fests in a local sushi restaurant. You see lots of nigirizushi with one of my favourites: toro salmon. There is also a gunkanmaki with what I think is meat. That is by no means a common or typical type of sushi, but I think we were feeling adventurous when we chose that one. 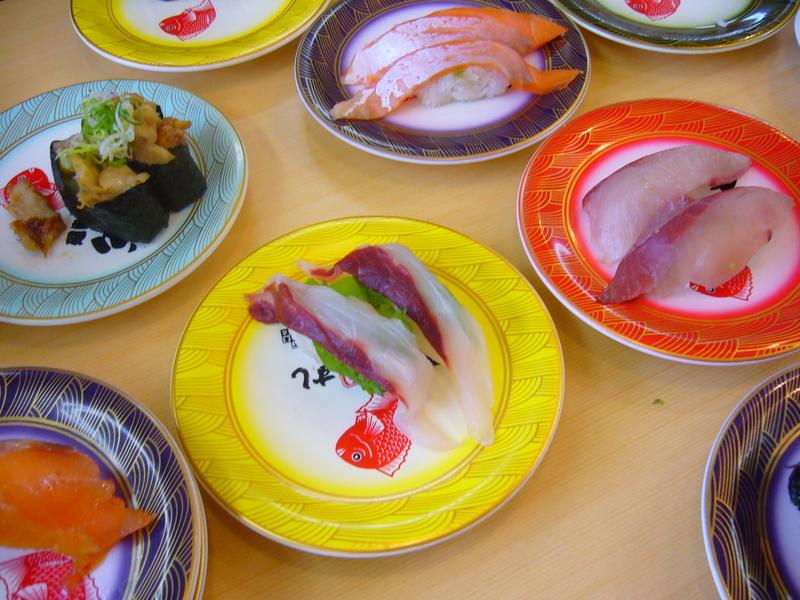 But despite the dominance of the nigirizushi, you do encounter makizushi (sushi rolls) in Japan. It is possible for a meal at a sushi restaurant to include a few pieces of makizushi, but they are mostly very plain and meant to top off your meal with something cheap and neutral tasting to fill up on, rather than being the focus of the meal. They are also quite thin. 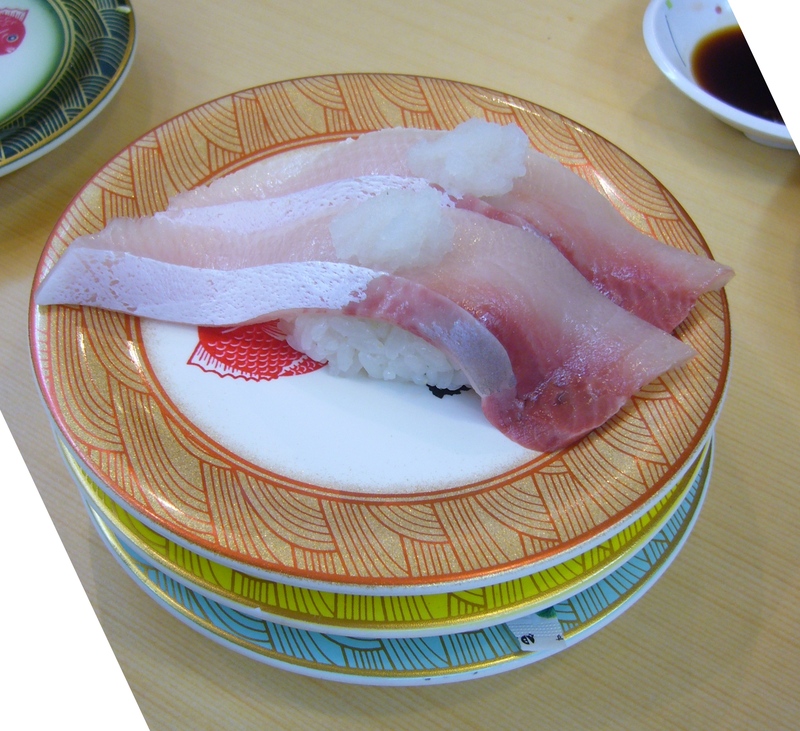 This kind of thin, plain makizushi is called hosomaki, which means ‘thin rolls’. 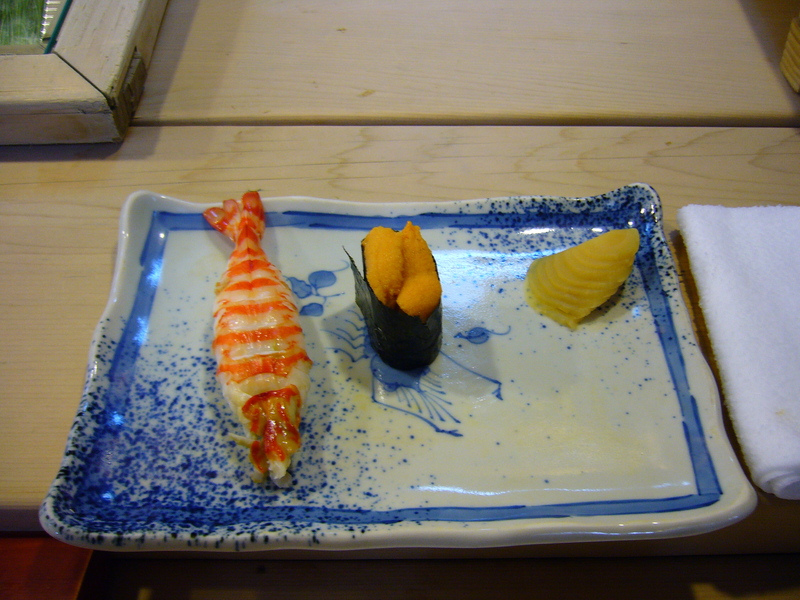 This is the makizushi that I got at the end of my meal at a more high-end sushi restaurant. They are a lot more simple and narrow than the makizushi served in Belgian sushi restaurants. These narrow makizushi are called hosomaki. The variety of makizushi that we see most often in the West is called futomaki. This means ‘thick rolls’. 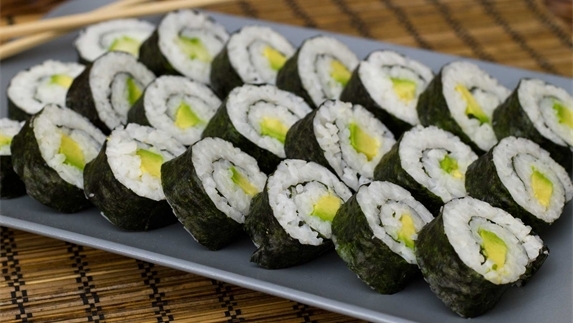 In the West, these sushi rolls are filled with a variety of ingredients, usually some kind of raw fish with several other ingredients in one roll. Sometimes they are fried as well. In Japan, futomaki are usually vegetarian. Futomaki is popular during the Setsubun holiday, when it is considered good luck to eat an entire, uncut futomaki roll while facing that year’s lucky direction, as determined by the zodiac symbol of that year. Futomaki sushi rolls for Setsubun. Eating one of those babies in one go seems like a daunting task. I guess you have to make a bit of an effort if you want to have good luck. There are some other types of sushi that I mostly came across outside of sushi restaurants. One of those is temaki. This literally means ‘hand roll’. I saw this kind of sushi at sushi parties at people’s homes. At a sushi party, people put all the ingredients for sushi out on the table, the guests compose their own sushi cone to their liking and eat it at once. The procedure is repeated until everyone has had their fill. 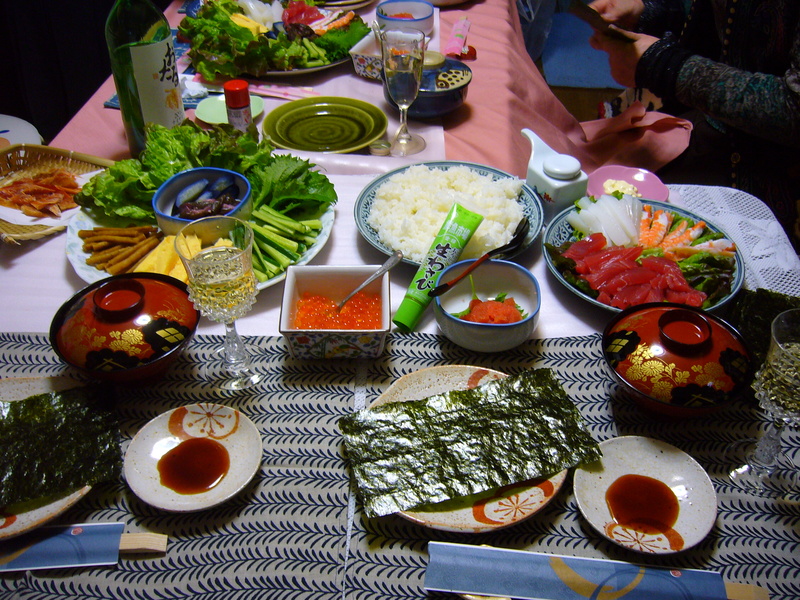 The table setting for a sushi party at my neighbour’s house. You take a piece of nori, put some rice on it, add the ingredients of your choice, roll it up in a cone and eat it directly to avoid the nori getting soggy. Another sushi party. On the left, you can see the start of a temaki, with the rice on the nori. Too bad I didn’t take any pictures of the finished cone. The cone usually looks quite messy, but since you eat it right away, that doesn’t matter at all. And the taste is delicious! Inarizushi is another type of sushi that is fairly unknown in the West. Inarizushi does not contain any fish. It is an oval rice ball, wrapped in a pouch of fried tofu. It is one of the cheapest kinds of sushi. 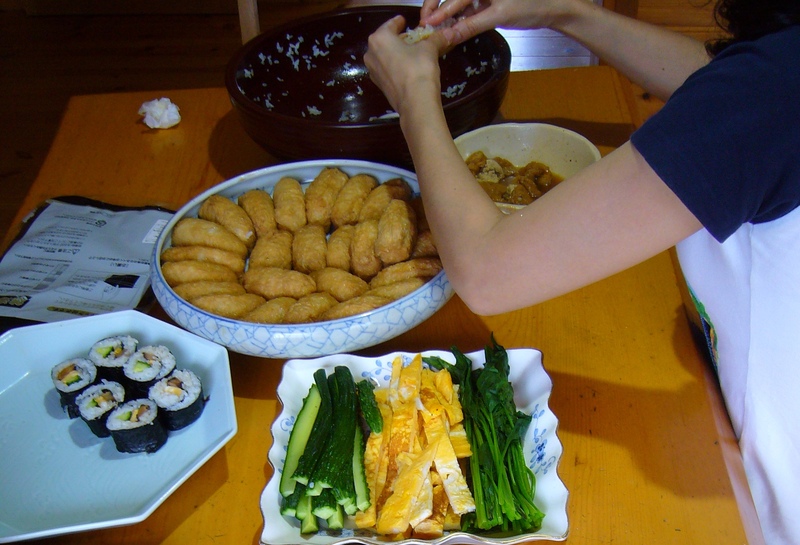 Inarizushi is a popular ingredient of homemade bento lunch boxes. Making a big bowl of inarizushi. On the top right, you can see the fried tofu pouches soaking, and they are being filled with sushi rice. Another lesser known form of sushi is chirashizushi, which means ‘scattered sushi’. This is a bowl of sushi rice (i.e. rice seasoned with vinegar), topped off with raw fish. 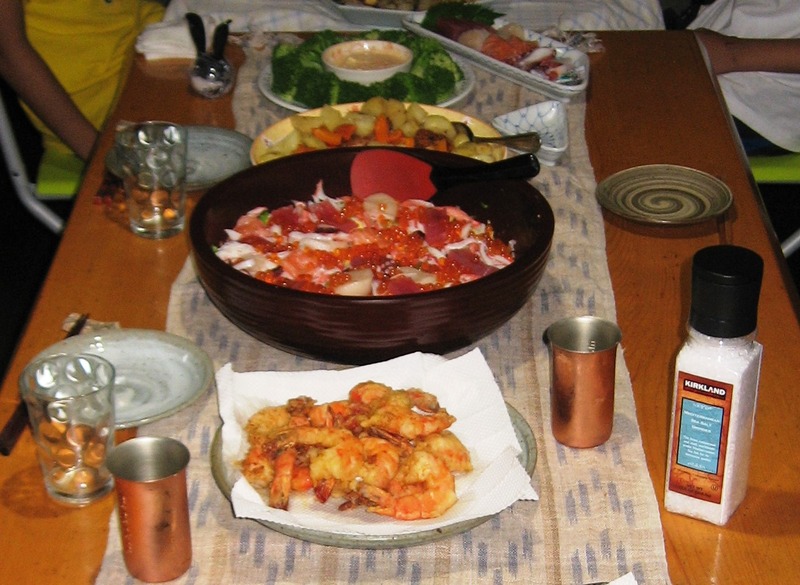 It is typical of Hinamatsuri, the doll festival on March 3rd, but it is also eaten the year round. A big bowl of chirashizushi for dinner at a friend’s house. Underneath all that delicious raw fish is sushi rice. Finally we might consider sashimi, which is raw fish and shellfish. 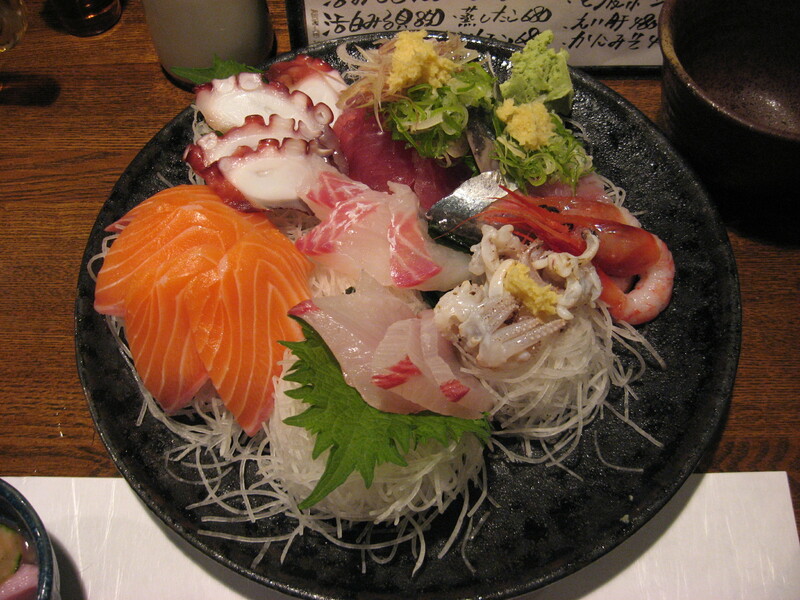 By many Westerners, sashimi is mistakenly considered to be a form of sushi. While sushi and sashimi are often served in the same restaurant, they are not the same thing. The main difference is that sushi always involves rice while sashimi is raw fish without rice. Sashimi must always be eaten with chopsticks while sushi may be eaten with the hands if one so chooses. A plate of delicious sashimi at an izakaya in Toyota City. As you can see, there is no rice in sight. What is your favourite type of sushi?